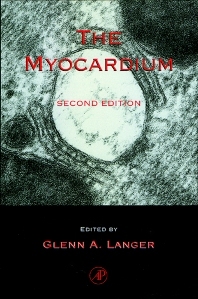 The Myocardium, Second Edition is a comprehensive presentation of cardiac function, including ultrastructure, cellular development and morphogenesis, ion channels, ion transporters, excitation-contraction coupling and calcium compartmentation, mechanics and force production, and energy metabolism. The Second Edition presents the new molecular, subcellular, and cellular developments which have occurred in this rapidly expanding field during the past 22 years. J.S. Frank, Immunolocalization and Structural Configuration of the Membrane Proteins Involved in E-C Coupling in Cardiac Muscle. H. Zhu, Cellular Development and Morphogenesis. J.N. Weiss, Ion Channels in Cardiac Muscle. G.A. Langer, Excitation-Contraction Coupling and Calcium Compartmentation. K.P. Roos, Mechanical Function at the Subcellular and Molecular Level. J.I. Goldhaber, Cardiac Metabolism in Normal and Ischemic Myocardium. G.A. Langer, Overview of Myocardial Cellular Function. Subject Index. Cardiovascular Research Laboratory, University of California at Los Angeles, U.S.A.